Welcome parents, families and friends! 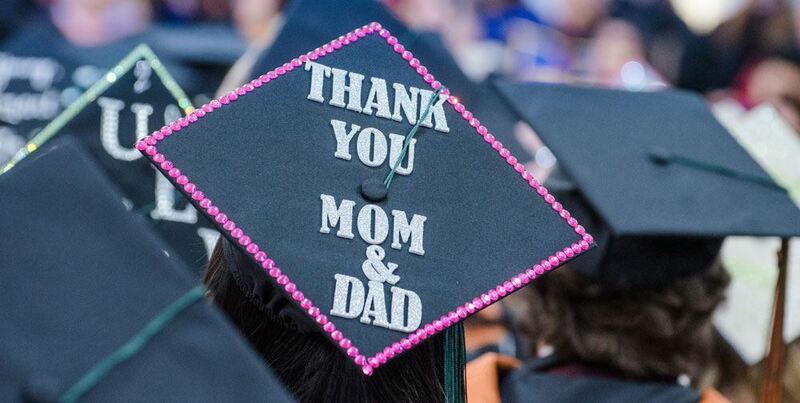 Please read the information in the links below as you prepare for the upcoming Spring 2019 Commencement celebrations. We recommend that guests arrive one hour and a half prior to the ceremony to secure parking and seating. Once guests find parking, go directly to Ortmayer Stadium. Guests arriving late may have difficulty finding parking and a seat. Guests are not allowed to enter the Ortmayer Stadium during the processional which starts 15 minutes before the ceremony begins. On Commencement Day, University of La Verne’s parking permit requirement for on-campus parking will not be enforced. However, Campus Safety will continue to enforce the parking restrictions for all on-campus parking lots/stalls as follows: 20 minute, Reserved, Handicap (Handicap placard or plate is required), or in fire lanes, at any time. Due to the volume of students graduating that day, plan to arrive early to find parking and carpool. If you park on the street, be aware of time limits and unauthorized spaces, as the City of La Verne Police will be ticketing. Handicap parking spaces are available on a first-come-first serve basis in all parking lots. The La Verne Police Department and our University Campus Safety Officers do patrol and issue tickets if official Handicap plates and/or Handicap placards are not posted on your vehicle. Do not park in a Handicap space without an official California issued Handicap parking permit. All guests attending must have a printed e-ticket in order to enter the venue. Children age 2 and under do not require a ticket but will need to remain on a parent’s lap for the duration of the ceremony. Tickets are free of charge, unique to each college ceremony, and only valid at the Commencement ceremony listed on the ticket. Due to the high volume of expected guests, if guests do not have a ticket or they have a counterfeit ticket, they will be denied entry. The sale and/or copying of commencement tickets is strictly prohibited. There is no overflow seating available. The ceremonies will be live broadcast and can be accessed through any device with internet access. The link will be available from the Commencement website “Watch Live” tab 5 minutes before the ceremony begins. All the Spring Commencement ceremonies will take place in the Ortmayer Stadium, which is an outdoor venue. Doors open one hour prior to the start of each ceremony. Seating is available on the stadium floor on chairs or on the bleachers. Seating at commencement is general admission and on a first-come, first-serve basis. Access to the Stadium is through the north or south entrances. Important: Due to limitations in space in the Stadium, please be advised that purses, personal belongings, etc. must be held by individuals and not placed on the nearest seat. All seating spaces must be kept open in order to accommodate all of the guests at each ceremony. Wheelchair access to the venue is through any of the entrances that leads directly to the ceremony. There will be two ADA tents available for guests with disabilities. No wheelchairs are allowed in the aisles due to limited space. For assistance at the ceremony, please contact an usher. A limited number of wheelchair spaces are reserved on the main floor. Wheelchair spaces are reserved at the end of rows with (1) designated chair held for attendants. Designated wheelchair spaces available on a first come-first serve basis. It is recommended that guests arrive an hour and a half prior to the beginning of the ceremony. We recommend that you prepare for the weather since it will be a warm day (wear sunblock). Outside food and beverages are not allowed. Our aim is to provide for all of our graduates and their guests, a clean and well kept facility to enjoy and celebrate the accomplishments of our graduates. Alcohol and drugs are strictly prohibited. Balloons (mylar or latex) are not allowed. We cannot permit balloons that might be accidentally released that might float into the sky and interfere with cables. Balloons should be left in the car or not brought at all. Due to limited space inside the Stadium, strollers are not allowed. Guests will also not be allowed to leave strollers outside of the venue. For safety reasons, children should not be allowed to play on the bleachers or in the aisles and should be supervised at all times. Please do not allow your children to be unattended at any point during your visit. To respect the importance and formality of the event for our candidates, no bull horns, noise-makers, or amplified devices are allowed in the ceremony. If disruptive behavior occurs guests could be asked to leave the premises by staff or Campus Safety. We understand the importance of capturing the moment. For this reason, the University has contracted GradImages to take a picture of the graduate when they receive their diploma case. Guests are not allowed to proceed into the graduate sections to take pictures or to block the aisles. Guests will be approached by staff and warned to proceed back to their seats. Guests that do not abide by the request of a staff member will be asked to leave the premises. For a list of accommodations around the university, click here. For a list of restaurants and eateries around the university, click here.